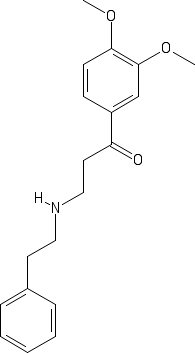 1'-Oxomethyleugenol-PEA is an adduct of phenylethylamine and 1'-oxomethyleugenol. This adduct might form in vivo. The closely related 1'-oxoelemicin has been shown to create dimethylamine, piperidine, and pyrrolidine adducts in vivo (see the article 1'-Oxoelemicin for more details). This adduct might form spontaneously. The very closely related 1'-oxoestragole has been shown to react with a number of amines at room temperature without a catalyst (see the article 1'-Oxoestragole for more details).